Remember Hayley Mills, the childhood star of Disney films, “Polyanna,” for which she won an Academy Award, and “Parent Trap”)? 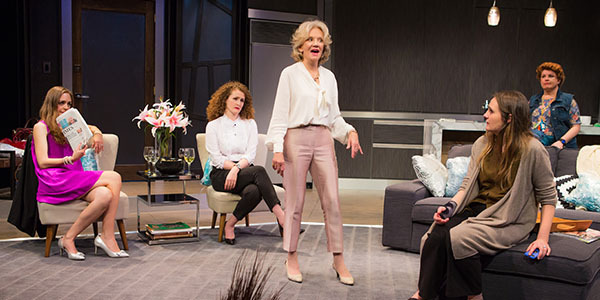 While she has not been much of a presence on-screen in recent decades, she is still going strong on-stage, as she demonstrates in Isobel Mahon’s “Party Face” at City Center Stage 2. “Party Face,” set in Dublin, is a comedy with serious undertones. The setup is Mollie Mae (Gina Costigan), is home from the psychiatric unit after suffering a nervous breakdown in a supermarket and attempting suicide. Contributing to her gloom is the abandonment by her husband (who doesn’t appear in the play). She decides to throw a party to celebrate her release from the hospital as well as the remodeling of her kitchen. Does that sound very believable? The guests are Mollie’s sister, Maeve (Brenda Meaney); her neighbor Chloe (Allison Jean White), a man-eater invited by Mollie’s status worshipping mother; Bernie, an obsessive/compulsive fellow patient from her psych ward (Klea Blackhurst); and Mollie’s mother, Carmel (Ms. Mills), a materialistic suburbanite who consistently insults her daughter with sweet jibes. Carmel is the type of mother who believes that “every knock is a boost.” For example, on entering her daughter’s home, she notices the “lovely flowers,” but can’t resist commenting, “Course in my day you never saw a lily outside of a funeral parlor, but sure, that’s progress.” Carmel desperately wants to hide Mollie Mae’s recent troubled history. Lara De Bruijn’s costumes perfectly suit each of the characters and Jeff Ridenour’s tasteful set (a kitchen and living room) is worth celebrating. Mahon knows how to write a funny line and Bearse (who directed many episodes of “Married …With Children”) knows how to deliver it. Where they both succeed less well is in the more serious undertones. The play may not need a man, but it does need to dig deeper into its characters’ psyches, especially Mollie Mae’s. “Party Face” has been a hit in Ireland under the title, “Boom?” Here, it comes off as a slick sitcom, which is fine if that is all you are seeking. Also, Hayley Mills, who happens to look great, is always worth seeing. The play is running until April 8th at City Center Stage 2 (131 West 55th Street; 212-581-1212). Tickets start at $39. Amanda Bearse joins the cast for the last week only: April 2-8!